Source: Office for National Statistics on behalf of the Controller of Her Majesty's Stationery Office. Study these three sentences and then write three similar sentences about other parts of the chart. 1) Women spend over twice as much time doing kitchen tasks as men. 2) Men spend 30 minutes a day doing kitchen tasks whereas / while women spend 74 minutes a day. 3) Women are more active in the kitchen than men (74 minutes a day for women as opposed to 30 minutes for men). Look at the following sample answer to the writing task. Write a word in each space. The chart shows the average number of minutes per day men and women in Great Britain spend on jobs around the house. 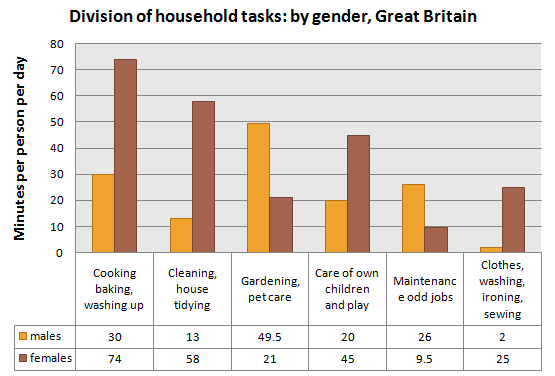 In total, men spend just .................... two-and-a-half hours on household tasks whereas women spend slightly .................... than four hours. Women spend more than .................... as much time doing kitchen tasks such as cooking and washing up .................... men (74 minutes for women as opposed .................... 30 minutes for men. Women are also more active in cleaning the house- it takes 58 minutes of their day compared .................... 13 minutes for men - and childcare, where women put in more than twice as .................... time as men. On the other hand, men are .................... active in gardening and pet care, where they spend twice as .................... as women, and maintenance and DIY, on which they spend 15 minutes more .................... women. Women account for almost all the time spent on washing and ironing clothes. This takes them 25 minutes, .................... men spend just 2 minutes on this task. Overall the figures show that women spend more time on routine domestic chores than men, .................... men do more household maintenance, gardening and pet care.